January to April sees all the preparation taking place. These pictures are of the room after most of the furnishings, fixtures and fittings have been removed. The electricians have removed all the old wall sockets, including some 3-phase connections that used to power the bakery mixers and machinery, and they have left the new wiring for the studio dangling in a corner so that we can seal it into the new soundproofing. 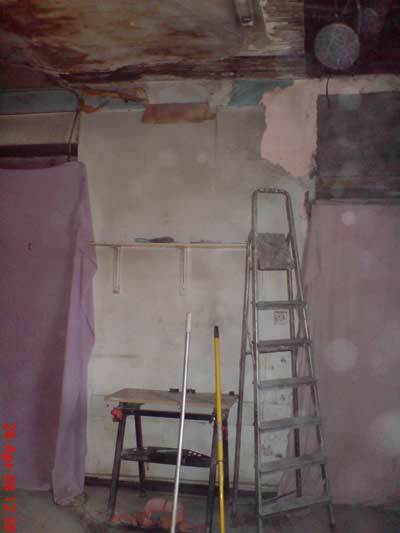 The ceiling in what will become the new hallway has had the rest of the plaster removed, to make a neater connection for the plasterboard. 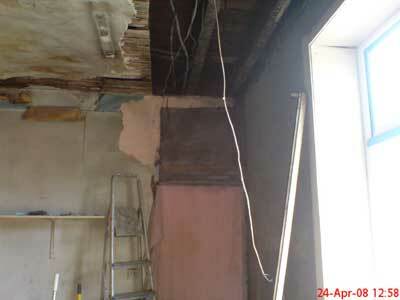 Next to go will be the plaster on the gable end wall before the rest of the shelving and doors are removed. Despite hanging dust sheets over all the openings and doorways, the plaster dust continues to cover the whole house for the rest of the year!